Your students will be experts at tempo words after using #TempoVirtuoso! Our students are social media pros and most are well acquainted with the practice of hashtagging. In case you aren't, a hashtag (#ahashtaglookslikethis) is usually a keyword that relates to a social media post. It's sometimes just a word that refers to the main idea or sometimes a comment. For instance, if I posted on facebook that I made a wrong turn while taking my daughter to school, I might hashtag it #NeedMoreCoffee, #MorningCommute, #Sleepy, or #DailyGrind. On social media, I could click on the hashtag and find other posts made other people with the same hashtag. 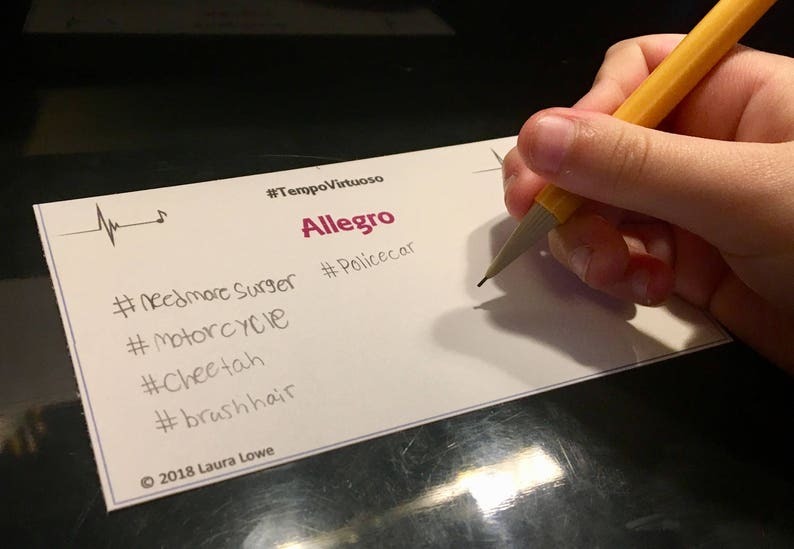 With this activity, students receive a reference sheet with 18 music tempo words and their definitions, and then they use their creative thinking to list hashtags to describe each word. You can have your students do the entire list, or only a few. There is an index card for each word. They can be printed on card stock and cut apart, or you can print them on the Avery index card blanks. (#5388) Clip them together in the student's lesson binder for a quick reference! You're free to print as many as you want for all the students in your studio. Please don't sell this resource or share it with another studio. Download instructions: Once payment is complete, you can access your files in one of two ways. Etsy will send you an email with links to download. If you don't see it, be sure to check your spam folder. A second option is to go to the upper right of your screen at Etsy, click on "you" then on "purchases and reviews" The link is right there to download. For more teaching ideas, visit my blog at lowepianostudio.blogspot.com! Prompt and secure shipping. Item exactly as described. Appreciated seller's confirming email. Thanks! Very pretty condition. FAST shipping, well packaged. THANK YOU! Nice item & seller, fast & friendly--thanks!! Super cool vintage scarf. I'm a vintage California girl. We are a perfect match. Beautiful condition. Nucely packed. Thanks!